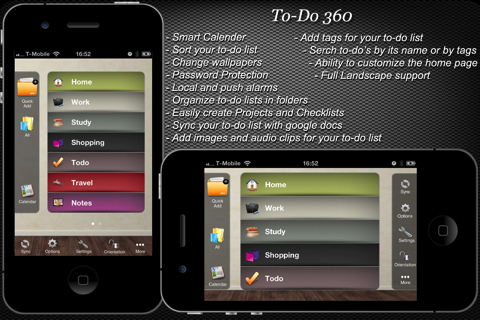 ToDo 360 is a utility app that blends to-do lists and project management together. ToDo 360 does not replace your go-to to-do list iPhone and iPad app, but it would be a great extra resource for larger, ongoing projects. Due to the scope of items that can be incorporated and the high-level of functionality supported, ToDo 360 helps you manage intricate processes with touches on the screen. The quick add button opens a window with incredible functionality. If you need to send an email, then you can set a reminder. Once the email is sent and you receive a response, you can remind yourself to jump online to research an item relating to your project. You can add notes to continue to monitor your progress. A cool option is to add Google searches directly from the ToDo 360 iPhone app. You can set due dates and alarms to remind yourself of details. All of the reminders and alarms incorporate customized settings, so that you can be as precise as you want or need to be. You can monitor meetings and locations. Where appropriate, the ToDo 360 iPhone and iPad app syncs directly with your existing contacts or supports you to jump online to find missing information. You can attach pictures and Google documents to the project. The ToDo 360 iPhone and iPad app addresses the complex possibilities surrounding the execution of a project effectively. The home screen has a list of default categories to help you manage your life and projects. The list is exhaustive, and the capabilities are vast. You can remind yourself to send a text, check out a website, listen to audio, and set alarms. If I need to remind myself to buy bagels, ToDo 360’s iPhone app is more than I need or want. But where it would really work is managing a project for work that requires you to keep up with items outside of the office. Or, if you are orchestrating a fundraiser for your child’s school, church, or museum, this is where ToDo 360 can become your lifeline. As an entrepreneur, ToDo 360’s universal download would enhance productivity. Visually, the ToDo 360 app is not particularly appealing–even if you change to another wallpaper. ToDo 360 is a workhorse. And, sometimes, it’s better to get the job done. If you need exquisite, modern graphics and effects to inspire you and motivate you, then ToDo 360 is not for you. Please be aware ToDo 360 is a free download, but it requires $4.99 to keep it rolling. If you need to keep several significantly large balls in the air, an investment of $4.99 to do so would be worthwhile. ToDo 360 adds an incredible scope of functionality and utility to your iPhone and iPad. AppSafari review of ToDo 360 was written by Jenni Ward on January 27th, 2012 and categorized under App Store, Free, iPad apps, Notes, Productivity, Universal. Page viewed 5208 times, 3 so far today. Need help on using these apps? Please read the Help Page. 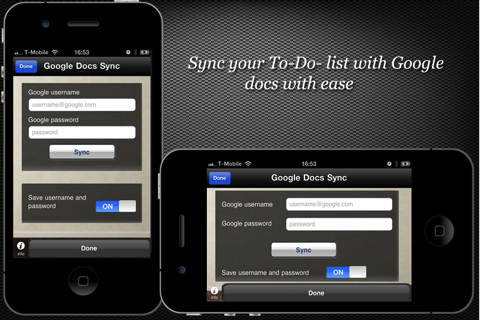 Looks interesting…have you tried using this app to sync with Google Docs?